During the November 2 National Council on Family Relations (NCFR) conference, FCS colleagues Patrice Powers-Barker, Katie LaPlant, Carmen Irving and Jacqueline Kirby Wilkins hosted a session on the Family Life Education (FLE) Framework. 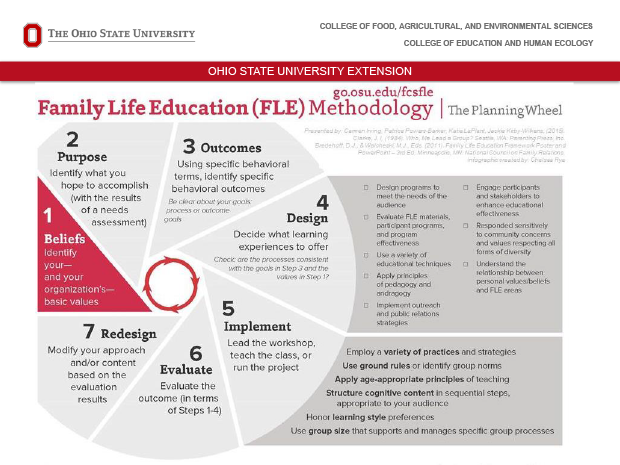 They presented a Planning Wheel infographic and FLE Framework infographic that are designed to complement, not replace, NCFR's current FLE Framework materials. They share the value and content of the conceptual model in a way that professionals, like FCS Educators as well as other Extension colleagues, can easily access, view, and implement FLE methodology in their daily work.